We had a small disagreement with the wind school who appeared to want to use the piece of beach we were flying on for their land yachts. We weren't to be moved. 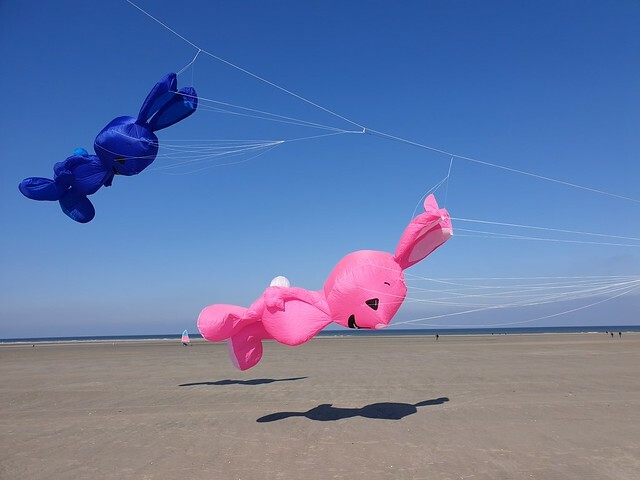 Peter put up his midi ray and flew his chinese dragon from it, while I used my flowform once again and flew my rabbits from it. Once again the weather was bright and sunny, but the wind very chilly. But we stuck it out until early afternoon, but then went off to seek beer to try and warm ourselves up. A lot of the afternoon was spent searching for Andrew Beattie. Peter has been talking about ordering a midi Andreas Ray for some time. We saw a nice colour scheme yesterday and bumped into Andrew on our way to the beach this morning, which started the discussion. Andrew assured us he would be on the beach all day, but everywhere we looked, we had just missed him by 5 minutes. Hey ho, we'll find him eventually. 7.30 in the morning and there are already some giant kites in the sky. We are going to have a leisurely breakfast! Today is going to be a stick kite day for us. I haven't flown a sports kite for over a year, so last night Peter persuaded me to take one out with me. My instrument of torture was to be a Talon by Jest of Eve Kites. Unfortunately it looks like they are no longer available! But I had about an hour and a half playing with this kite, which I still think is probably the best sports kite I've got. 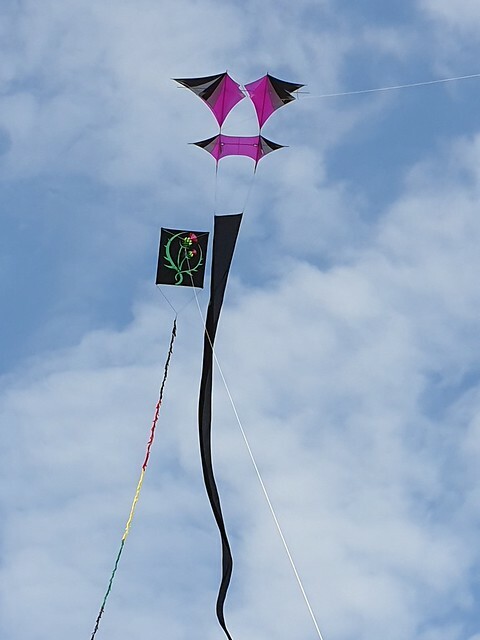 Meanwhile Peter spent his time putting together an Ichiban (upside down, but don't tell him) When I had had enough of flying my sports kite, I switched to a della porta, and Peter switched to a Robert Brasington gothic delta. Eventually I got so cold that I needed to switch back to the sports kite just to get some blood flowing again! Meanwhile a looming figure strided across the field advising that everywhere he went yesterday he was told that there were two English(!) blokes looking for him. Yes it was Andrew Beattie. I left him and Peter to it, but the outcome was that a ray has been ordered. Around 2 pm we decided it was just too cold, so we went back to the bar. Later I went trying to find Jacquie, but with no luck, so went back to another bar before dinner!